R. J. Reynolds Tobacco Company began as Reynolds Industries, a small tobacco company in what is now Winston-Salem. Twenty-four-year-old Richard Joshua Reynolds moved from Virginia to Winston-population about 400-in 1874 and immediately recognized two commercial advantages: the town was the center of the new flue-cured tobacco market and was on a newly constructed railroad line. Reynolds bought a lot next to the tracks and built the "Little Red Factory," a two-story building that covered less area than a tennis court. In the spring of 1875 he hired a few workers and produced 150,000 pounds of chewing tobacco that year. As his company rapidly grew, Reynolds experimented with using saccharin as a sweetener, although publicly he said that only the area around Winston could grow tobacco so "naturally sweet." He established a large sales force and almost continually brought in new, modern machinery to increase production. Reynolds used his capital wisely to expand his facilities and buy out competitors. He incorporated the R. J. Reynolds Tobacco Company in North Carolina in 1890. In 1899 Reynolds Tobacco became part of James B. Duke's tobacco trust, but it went independent again when the trust was broken up in 1911. After the turn of the century, Reynolds Tobacco produced one-fourth of the nation's flat plug chewing tobacco. Anticipating an increase in the popularity of smoking tobacco, Reynolds introduced several new brands, including Prince Albert pipe tobacco in 1907. Prince Albert was an instant success: production in the first four years went from 250,000 pounds annually to more than 14 million pounds. In that era most smokers rolled their own cigarettes, but Reynolds introduced four manufactured brands in 1913. Camel, a blend of burley and bright leaf tobaccos, with a touch of Turkish leaf for aroma and taste and a healthy amount of sweetener, became an astounding success. The public bought 425 million Camel cigarettes that first year, and four years later Camel was the most popular cigarette in the United States. The label, drawn from a photograph of Old Joe, a dromedary from the Barnum & Bailey Circus, was famous throughout the nation. By 1925 more than one-half of the cigarettes smoked in the United States were Camels. Richard Joshua Reynolds died in 1918. That year his company employed 10,000 people who worked in 121 buildings in Winston-Salem (the two towns had merged in 1913). In 1929 the company's headquarters moved into the Reynolds Building, which was cited as the best new building of the year by the National Association of Architects. A larger replica, the Empire State Building, was later built in New York City. Over the years Reynolds Tobacco produced other successful cigarette brands, including Winston, Salem, Vantage, and Doral. When television took over American entertainment, Reynolds used this new advertising medium to reach a nationwide audience. In 1948 Camel cigarettes sponsored the Camel News Caravan with John Cameron Swayze, one of the first national news programs. Reynolds diversified its international tobacco operations, and in 1956 the company amended its charter to permit investment in nontobacco enterprises. Archer Aluminum, originally formed to produce foil for tobacco products, began making other consumer packaging products. Reynolds purchased Hawaiian Punch fruit drink, Vermont Maid syrup, Chun King oriental foods, Patio Mexican foods, and other brands that were placed under subsidiary RJR Foods. In 1969 Reynolds acquired Sea-Land Service, Inc., the world's first and largest containerized freight operation. In 1970 Reynolds entered the energy business by acquiring American Independent Oil Company. Also in 1970 the company became R. J. Reynolds Industries, Inc. (RJR). Acquisitions continued throughout the 1970s and 1980s, with RJR obtaining Burmah Oil and Gas Company and Burmah Oil Development, Inc. (1976); Del Monte, the huge processor of fruits and vegetables (1979); Heublein, Inc., a worldwide marketer of distilled spirits (including its flagship product, Smirnoff Vodka), wines, fast foods, and grocery products (1982); and Canada Dry and Sunkist soft drinks (1984). RJRspun off its Sea-Land Service and sold its energy business before acquiring Nabisco Brands, Inc., in 1985. The parent company became RJR Nabisco, Inc., and management moved the corporate headquarters from Winston-Salem to Atlanta. In the late 1980s, a wild bidding war raged for the huge company. The investment firm Kohlberg, Kravis, Roberts & Company won with a $25 billion leveraged bid. The buyout was said to symbolize the economic climate of the 1980s and was the subject of Bryan Burrough's best-selling book Barbarians at the Gate: The Fall of RJR Nabisco (1990). Saddled with the huge debt, RJR Nabisco sold off assets and in the early 1990s became a publicly traded company again. Headquarters were subsequently moved to New York City. In 1985 RJR Nabisco was challenged by critics of the tobacco industry for introducing the character of "Joe Cool Camel" in advertisements for Camel cigarettes. Although the company denied that the advertising campaign targeted underage smokers, the character was immensely popular, and Camel's share of the under-18 market increased from 0.5 percent to 32.8 percent in the two years following Joe Camel's appearance. In July 1997 RJR Nabisco decided to retire the controversial figure and replace him with other advertising themes targeting "mature" consumers. Faced with tobacco's massive legal liability, in March 1999 RJR Nabisco announced the sale of its international tobacco business and its plans to split the domestic tobacco and food businesses into two independent companies. That June R. J. Reynolds Tobacco Company became the wholly owned subsidiary of R. J. Reynolds Tobacco Holdings, Inc., and corporate headquarters returned to Winston-Salem. In January 2002 R. J. Reynolds Tobacco Holdings, Inc. acquired Santa Fe Natural Tobacco Company, Inc., and two years later merged with Brown & Williamson Tobacco Company to form Reynolds American, Inc.
Nannie M. Tilley, The R. J. Reynolds Tobacco Company (1985). "History: A Look into our Past." RJ Reynolds Tobacco Company. http://www.rjrt.com/history.aspx (accessed June 27, 2012). Lampert, Hope. True Greed: What Really Happened in the Battle for RJR Nabisco. New York, N.Y.: New American Library. 1990. Tursi, Frank V., White, Susan E., and McQuilkin, Steve. The Lost Empire: the Fall of R.J. Reynolds Tobacco Company. Winston-Salem, N.C.: Winston-Salem Journal. 2000. Reynolds, Patrick, and Shachtman, Tom. The Gilded Leaf: Triumph, Tragedy, and Tobacco: Three Generations of the R.J. Reynolds Family and Fortune. Boston: Little, Brown and Co. 1989. Sticht, J. Paul. The RJR Story: The Evolution of a Global Enterprise. New York:Newcomen Society in America. 1983. "R.J. Reynolds, the quiet giant." Mainliner 12. No. 1. January 1974. R.J. Reynolds Tobacco Company. A Short History of R. J. Reynolds Tobacco Company. [Winston-Salem, N.C.: R.J. Reynolds Tobacco Company. 1961?]. Schnakenberg, Heidi. Kid Carolina: R.J. Reynolds, Jr., a Tobacco Fortune, and the Mysterious Death of a Southern Icon. New York: Center Street. 2010. R.J. Reynolds Tobacco Company. Golden Leaves: R.J. Reynolds Tobacco Company and the Art of Advertising. Winston-Salem, N.C.: R.J. Reynolds Tobacco Company. 1986. 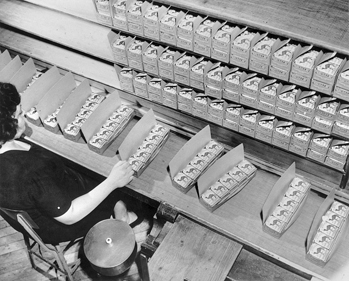 Inspecting cartons of Camel cigarettes at R. J. Reynolds Tobacco Company. North Carolina Collection, University of North Carolina at Chapel Hill Library. Is the affair w/the wife of the owner of the Reynolds tobacco company from NC, from the Hamilton production a true story? It is true that Alexander Hamilton had an affair with Maria Reynolds, wife of James Reynolds. However, this was more than 80 years before the R.J. Reynolds tobacco company was founded. The company was founded by Richard Joshua Reynolds, who you can read more about here: https://www.ncpedia.org/biography/reynolds-richard-joshua. From what we know it is unlikely the Richard was descended from James and Maria. I loved my " Luckie's. They were my friends " never wore a shirt that did not have a place for my pack . Never did see much success in the wrapping a pack in your T shirt sleeve . It looked good in stills , but not for practical purposes .Even just to get a whiff emanating from the shirt pocked was like a line of blow . But in the end they betrayed me , my friends did . Cursing at my friends from under the oxygen was difficult but meaning full . Thanks for taking the time to post your question to NCpedia. You may wish to contact the RJ Reynolds Company at http://www.rjrt.com/contactus.aspx. I hope you are able to have your issue resolved. Good luck! Dear RJ Reynolds CEO, I found a bottle of Vermont Maid Syrup at my deceased parents' home in Little Falls, NY. They died about 1995 and they probably purchased it several years before. Since I ran out of real Maple Syrup this year (prior to returning to my other home in CO Spgs), I began using that 20 or so year old product of yours on my pancakes and waffles. It tastes the same as I recall it did when we used it when I was a kid (I was born in 1939). Why hasn't this product deteriorated?